1st slates are tiles. They are tiles made from pieces of natural rock, which have been cleaved (NOT SPLIT), from larger pieces, this is done at right angles to the bedding plane. As slates get old they deteriorate in two ways. They split longditudeonaly along the line of the bedding plane. Slate is formed from the low -temperature, regional metamorphism of fine-grained shales or mudstones. Its chief characteristic is that it easily splits along roughly parallel surfaces, known as cleavage planes. These are caused by the alignment of flat mineral crystals, especially micas. during the deformation and compression episodes which turned the original rock into a slate. As slate is a relatively low-grade rock, the aligned crystals are small and the cleavage planes are closely-spaced. Deformation under higher pressures and temperatures produces rocks which contain larger aligned crystals, such as phyllites and schists. Because of its cleavage planes, slate splits into parallel-sided slabs, a property that makes it an important roofing material. Some slates have more than one cleavage direction. The remnants of original sedimentary features, such as graded bedding, may be visible either parallel or slightly inclined to the cleavage. Distorted fossils are found occasionally in slate. The following BS clause is frequently ignored to save time and money often with disastrous and unsightly consequence. 158000 ParR 6 1990 Code of Practice for Slating and Tiling "Slates should be sorted into three or four groups of equal thickness. Sorting slates by thickness is as an important part of the slating process as is fixing them. 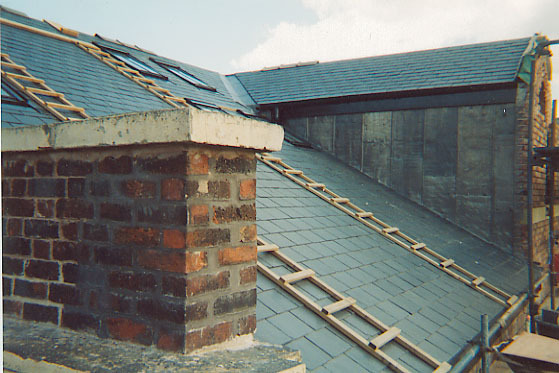 Slates must be graded on the ground, before being lifted to the roof. This is usually done during the holing process, but as slates are increasingly supplied pre-holed, the sorting and grading tends to be by-passed. Sorting and grading gives the roof an improved aesthetic finish and a stronger resistance to wind lift. When slates are not sorted before fixing, they do not lay true on each other, they kick-up and create unsightly and dangerous gaps. In such instances the roof generally looks awful. Most of the time the blame is directed to the supplier of slates, slates are a natural product and unlike man-made product, they cannot be exactly the same thickness. A tolerance of 20% in the variation of thickness is accepted, and this can mean a significant difference when applied to to 5-6mm products . 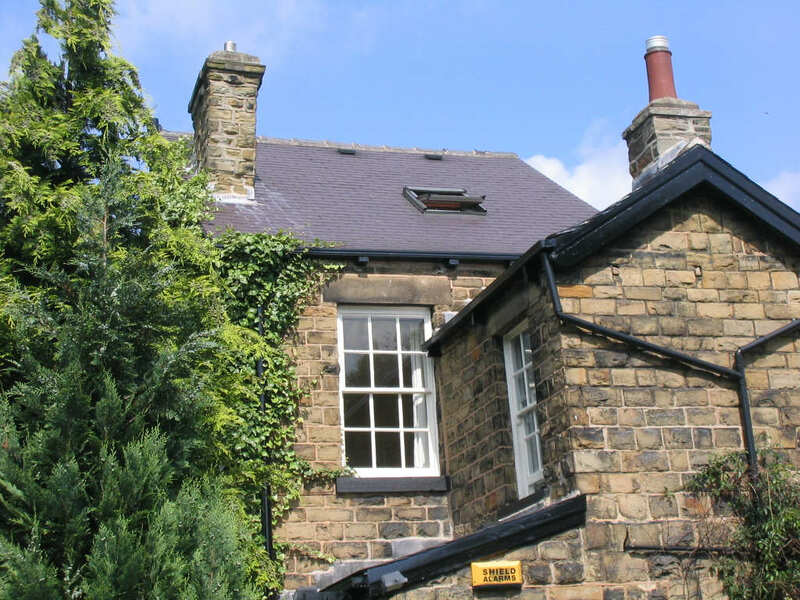 If the slate roof looks un-even and unsightly, look no further for the reason. Pose the question - were the slates sorted and graded before fixing as required by the British Standard? 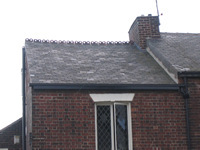 Many new roofs around Sheffield are not sorted and look terrible. Here is our top technician fixing Penrhyn slates to tanalised batterns at Nether Edge. 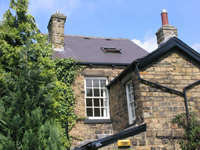 Note two of the vents can be seen, this is to provide ventilation to the roof void. This is now nearly 20 years old and still looks well. Here is the potting shed re-roofed in 1987 with re-claimed slate. At the same time Re-Mastic covered the flat roofs for us with High Performance felt. Another house we covered with Heather Blue from Penryhn. 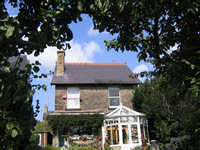 Also in Nether Edge, is this charming Semi, which we re-slated with re-claimed Welsh Slate.